When you’ve been in an accident your adrenaline is rushing, your heart is racing, and it can be challenging to think clearly. In most cases, when we’ve been in an accident the last thing on our mind is whether or not we’re documenting the scene and accident properly. While it can be tough to ensure that you’re getting all of the information and documentation that you need right after a crash has happened, it is incredibly important in terms of your case and the support you need to back it up. While your insurance company will handle the dirty work a majority of the time that you’ve been in an accident, there are times where you may need to turn to a personal injury lawyer to help support your case in court. Here are a few of the documents that are handy to hold onto if you do end up having to go to court. After you’ve been in an accident, the first thing that you should do is make sure that law enforcement shows up and files a police report and/or ticket. Whatever documentation they write out, you should receive a copy and hold onto it. The documentation that happens on the scene of the accident is some of the most critical information that you’ll receive and is a great way to back-up your case. The police report will include information that states who was at fault, the causes of the accident, the conditions leading to the accident, and so much more. By holding on to this documentation and tucking it away in the case that you need it down the road, you’re setting yourself up for success. After an accident, it’s always good to have some documentation of the damage and injuries that have occurred. If you were injured in the wreck, you might not be able to take pictures firsthand. If you’re able to, ask someone to take photos of the damage that’s happened to your vehicle as well as any visible injuries that you’ve endured. Having visible documentation and imagery to build a case is extremely helpful and can help in a variety of ways. These are forms of documentation that we suggest holding onto. You never know how they could affect your claim with insurance or your case in court. As you begin the process of making claims for financial and emotional compensation, you’ll realize just how essential it is for you to hold onto all medical documents. Everything from bills and x-rays to prescriptions and diagnoses are going to be incredibly vital for you to hold onto. This type of written confirmation is one of the best things that you can have in regards to building a case that leads towards you receiving your compensation. 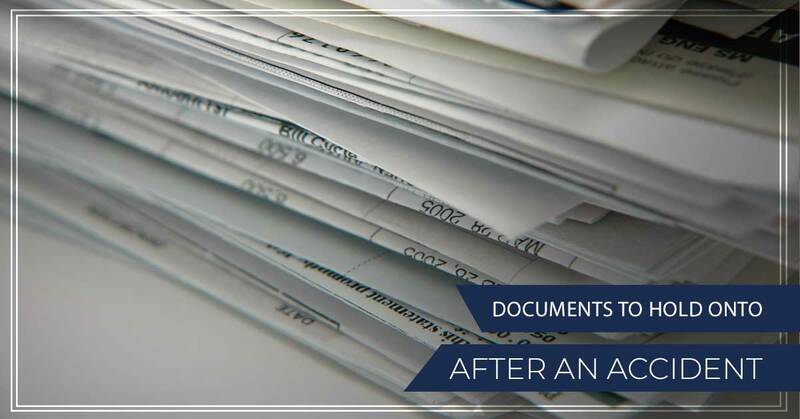 Over time it may begin to feel like you’re building up lots of medical documents, especially if you are receiving quite a bit of medical attention and care. Regardless of how much paper it seems like you’re collecting, hold onto it! Every document provides information and helps support your claims for reimbursement of medical bills and injuries. When a serious injury occurs, one of the struggles that often comes along with it is time off work so that proper healing can occur. While having the time needed to heal properly is something we can all be thankful for, there’s nothing like lost wages or long-term disability to make a bad situation even worse. If you’ve found yourself losing out on time in the office because you’re in need of time to recover and heal, make sure to hold onto any documents or paperwork that your job provides you with. Lost wages are a much easier scenario to receive compensation for, but having documentation of them makes the case all the more sound. That being said, it’s good to keep records of any bills that you acquire during this time to show just how much those lost wages hurt you. Anything from rent and utility bills to groceries and medical bills that you received in the time that you were off from work should be held until you’ve received full compensation for your lost wages. When you come across a time where you’re in need of a reliable auto accident attorney in Tulsa, you can count on the team at The Edwards Law Firm. Our team is dedicated to providing quality representation to each of our clients so that they can get the compensation that they deserve. Reach out to our team today to learn more about how you can start building your personal injury case. We will set up a consultation and provide you with more information on what you can anticipate when working with our team.